Over a 35 year period he was recognised as a Painter, Printmaker, Ceramic Artist, Architect, Art Teacher and Author. His renown now lives on in national and international spheres. He loved the windswept West Cork landscape and felt moved to record a disappearing environment. His paintings often depicted the doors, windows and walls of decaying buildings in repositories or memories of past inhabitants, long gone. His ceramics are instantly recognisable by the vivid pictorial decoration, such as brightly coloured fish or lobsters, that grace the surfaces of large platters and bowls. The windswept thorn tree became his icon and frequently appeared in his paintings and ceramic work. 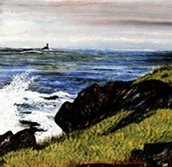 There is a mesmerist quality to his tempera paintings, which transformed elements of Irish vernacular architecture into textured surfaces. These were intensely tactile and somewhat disturbing. Like his trees, his tempera paintings have a presence that is instantly distinguishable. In these paintings he defines something of the feel of the Irish landscape in a way that has not been captured previously. John Verling was an exceptional artist and produced a wide range of work over many years. His painting, prints, illustrations and ceramic work form an important part of West Cork's artistic heritage.